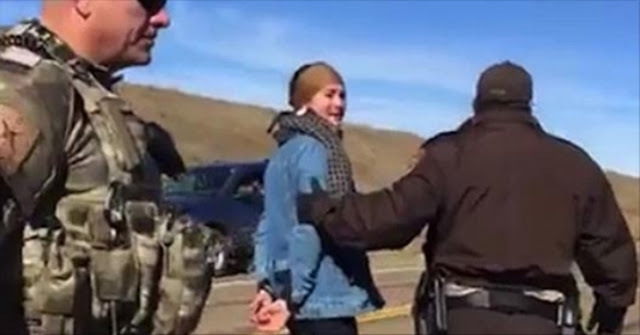 Shailene Woodley was arrested for trespassing while protesting the Dakota Access Pipeline ... law enforcement tells TMZ. The 'Divergent' star was busted Monday morning for trespassing during what she called a "peaceful protest" in Sioux County, North Dakota. About 100 protesters were on a construction site for the controversial pipeline project before cops moved in and put handcuffs on Shailene. Shailene was arrested for 2 misdemeanors ... including engaging in a riot. Cops tell TMZ they issued multiple warnings for the protesters to leave. 27 protesters were ultimately arrested. The planned pipeline crosses sacred Standing Rock Sioux land and burial grounds. On Sunday, a Federal appeals court rejected their request to stop the construction ... which sparked the protest. Standing Rock Sioux Chairman David Archambault II vowed to continue fighting the Dakota Access oil pipeline (DAPL) after a three-judge panel on Sunday October 9 denied the tribe’s request for an injunction that would have stopped the pipeline’s progress through treaty-protected, sacred burial grounds. Responses to "Actress Shailene Woodley Arrested While Protesting in Standing Rock"
Prayers going out now to stop the construction and preserve the precious lands amen.